In the small pier of Lake Montepulciano is docked an electric powered boat with solar panels, with 14 seats, for tours on the water, to be booked at the Visitor Center. 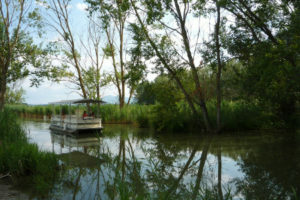 The Visitor Center of the Reserve is headquartered in the building of La Casetta, owned by the town of Montepulciano, and it is run by the Friends of Lake Montepulciano. Located a few meters from the lake, the Centre provides educational and informational material, a library and a conference hall, as well as a guesthouse with 30 beds and a kitchen for overnight stay and residence of hiking groups. At the Visitor Center it is also possible to book guided tours on the Path of the Tower and boat tours.